4 Smiles after the Summit? The future for India’s fruit and vegetable business looks very bright as opportunities beckon in new export markets while aspirational Indian consumers drive demand for higher grade domestically-grown produce and high-value imported fruits. That much was clear from Fresh Produce India, which attracted some 200 delegates from 20 different countries to Pune on 24-26 April for dynamic conference discussions, high-quality networking and educational study tours. The Indian business continues to grow on all fronts – be it exports, imports or domestic sales – despite significant roadblocks to development. But those problems, which so often dominate discussions about India, should not deter international companies from entering the market, said Sumit Saran, the new head of international foods for leading Indian retailer Future Group. India’s table grape export volumes to Europe have also multiplied over the past 10 years, but in order realise its future growth potential the industry must diversify, explained Geoff Green, director of group procurement and new business development for Capespan. Drawing on examples from major global table grape exporting countries such as Chile and Peru, Green outlined how the Indian industry can grow from its current annual export volumes of around 140,000 tonnes to become a 250,000-tonne business by 2025. That will put it on a similar footing to where Peru is today, but getting there will require a lot of work. India must develop new markets, particularly in Asia, and cut its dependence on Europe. It must develop new coloured varieties, and cut its dependence on white seedless grapes, particularly Thompson Seedless. It needs to create transparent data and information systems, and it must capitalise on the opportunity to extend its season by developing production in new growing areas, not least Tamil Nadu. India’s fresh produce business also has much work to do to bolster production and export processes and prevent breaches of food safety and phytosanitary standards, heard delegates to the ensuing high-powered panel discussion in the session ‘New market opportunities for India’s suppliers’. It’s a recurrent problem that often forces the industry to go into overdrive to recover both access to markets and the confidence of buyers – the recent EU ban on Indian mangoes and selected vegetables over pest breaches being the latest crisis to hit the industry. A lack of integration in the traditional industry structure of small-scale farmers, merchant exporters and government agencies also inhibits sustainable export development, heard delegates, but new grower-exporter models stand to improve the situation as Azhar Tambuwala, director of Sahyadri Farmers Producer Co explained. Tailoring technology solutions and transferring knowledge to such small-scale farmers is also key to boosting their productivity, as well improving the quality and traceability of products for consumers in India and overseas. In a session on sustainability, Driptech CEO Peter Frykman explained how its innovative, low-cost drip irrigation technology is helping such farmers to achieve higher yields and incomes. At the same time, it is providing solutions to India's problems with water shortages, and the wastage inherent in the prevailing flood irrigation system. Bayer CropScience’s Yogesh Mohite also explained how its Food Chain Partnerships were up-skilling Indian table grape growers, and integrating them into the supply chain to produce a safe and fully traceable product. 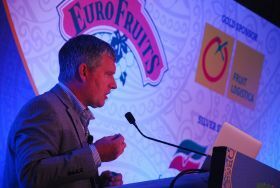 The final session of Fresh Produce India looked at new products and suppliers for India’s burgeoning fresh fruit import market. While imports are still heavily dominated by apples, other products such as oranges are gaining ground, a point underlined by Mahmoud El Shishiny of Magrabi Agriculture, who noted that Egyptian citrus exports to India had grown from 5,000 tonnes in 2010/11 to 26,000 tonnes in 2012/13. Indian consumers, used to eating mandarins and sweet limes, largely still see oranges as a juicing product, however, and they need to be taught how to peel and eat them too, according to The SCS Group’s Keith Sunderlal. Avocados are an even newer product for Indian consumers. New Zealand recently gained access for the fruit, and Tony Ponder of avocado export alliance Avanza explained the industry’s plans to develop the market in India. Despite the challenges, not least the lack of ripening and cold chain facilities, the retailers on the panel expressed cautious optimism for consumer acceptance. Younger consumers with a growing exposure to international food trends and cuisine are helping to drive interest in such new products. But a stronger modern supermarket retail sector is also seen as vital to speeding growth. Right now, many modern retailers continue to struggle with their fresh offer, and for some retailers the fresh department has simply become an exercise in managing losses. The question of whether they’re providing enough support to suppliers was a moot point, but Saikat Sarkar, GM and head of speciality foods for major retailer Spencer’s, said that his chain recognised its responsibility to educate shoppers. Organised by Asiafruit in association with The SCS Group, Fresh Produce India 2014 concluded with a day of study tours on 26 April. Delegates were able to choose between the Market Track, which visited wholesale and retail stores in Pune; the Production Track, which ventured out to India's largest fresh fruit packhouse near Nashik that was recently set up by Sahyadri Farmers Producer Co; or the Techincal Track, which went to see Driptech's irrigation systems in operation with small-plot farmers around Baramati.